Mice are characterized by pointed noses, small and rounded ears, and long and thin tails with no or little hair. 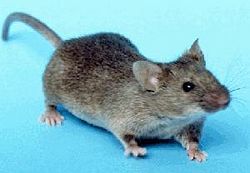 In all but the most restrictive use of the term (genus Mus), the main distinction between mice and rats is a matter of size, with relatively smaller animals, perhaps 12 centimeters (5 inches) or less, considered as mice and similarly looking animals that are larger designated as rats. As rodents, both mice and rats are characterized by dentition specialized for gnawing, including a single pair of upper incisors, a single pair of lower incisors, and a gap followed by one or more molars, as well as no canine teeth and not more than one incisor in each quadrant (Myers 2000). The remainder of this article will assume the more narrow, scientifically restricted definition of a mouse as being any animal within the genus Mus, unless otherwise stated. Although often regarded as pests, mice play important roles in laboratory research, ecological food chains, and as pets. The best known mouse species is the common house mouse (Mus musculus). It is found in nearly all countries and, as the laboratory mouse, serves as an important model organism in biology and is also a popular pet. The American white-footed mouse (Peromyscus leucopus) and the deer mouse (Peromyscus maniculatus) also sometimes live in houses (though they are not included in the "house mouse" category, nor are they included in the genus Mus). These species of mice generally live commensally with humans (that is, they benefit from humans without affecting humans either positively or negatively). Although they may live up to two years in the lab, the average mouse in the wild lives only about three months, primarily due to heavy predation. Cats, wild dogs, foxes, birds of prey, snakes, and even certain kinds of insects have been known to prey heavily upon mice. Nevertheless, due to its incredible adaptability to almost any environment and its general ability to live commensally with humans, it is regarded to be the second most successful mammalian species living on earth today (the first being the rat). In some ways, mice can be harmful pests, damaging and eating crops and spreading diseases through their parasites and feces. In the Western U.S., breathing dust that has come in contact with mouse feces has been linked to the deadly (though rare) Hantavirus. The original motivation for the domestication of cats is thought to have been for their predation of mice and their relatives, the rats. There is a diversity of opinion regarding the definition of mouse. In Webster's Third New International Dictionary, a mouse is broadly defined as "any of numerous small rodents typically resembling diminutive rats with pointed snout, rather small ears, elongated body and slender hairless or sparsely haired tail, including all the small members of the genus Mus and many members of other rodent genera and families having little more in common than their relatively small size" (Silver 1995). However, the order Rodentia (phylum Chordata) contains over 2,000 species and about 30 families (Myers 2000), many of which contain some animals that may be referred to as mice. The family Muridae itself contains over one thousand different species, including voles, gerbils, and rats (Silver 1995). Narrower definitions variously recognize mice as small, rat-like animals within the Muridae family, or within the Muridae and Cricetidae families, or within these two families and additional rodent families. For example, the Oxford English Dictionary (Simpson and Weiner 1989) and the Concise Encyclopedia Britannica Online (2007) asserts that any small animal in the family Muridae is a mouse. The latter text further specifies that "Species in other rodent families (e.g. deer mouse, pocket mouse) are called mice without scientific basis" (italics added). The deer mouse is a member of the family Cricetidae and the pocket mouse is a member of the family Heteromyidae. The American Heritage Dictionary (2000) restricts the term mouse to small, rat-like rodents of the families Muridae and Cricetidae. Myers et al. (2006) designate Muridae as including Old World mice and rats (as well as gerbils, whistling rats, and others), Cricetidae as including New World mice and rats (as well as voles, hamsters, and relatives), and Nesomyidae as including African and Malagasy endemic mice and rats. The Science and Technology Encyclopedia (Parker 1982) broadens the term to include small rodents of four families (Muridae, Cricetidae, Heteromyidae, and Zapodidae), and The Oxford American College Dictionary (2002) includes species in the families, Muridae, Heteromyidae, Zapodidae, and Muscardinidae. Within the Muridae family is the subfamily Murinae, and within this subfamily is the genus Mus. The most restrictive definition defines a "mouse" as a member of the genus Mus. (These are all small.) For example, Encyclopaedia Britannica (2007) (in contrast to the definition in the concise version) states that "in a scientific context, mouse refers to any of the 38 species in the genus Mus, which is the Latin word for mouse." It further notes that the common name is broadly, but "imprecisely" applied to rodents with bodies less than about 12 cm (five inches) long. Mice are small rodents, resembling diminutive rats. While they are typified by having pointed snouts, small ears, elongated bodies, and slender, hairless tails, different types of mice show large variations in physical features, and body dimensions especially vary considerably by species. The following are approximate values of physical features of an average mouse: a total body length of 28-130 mm and body mass of 2.5 to more than 34 grams (Nowak 1999). Mice generally live on a herbivorous diet, but are actually omnivores, as they will at times eat meat, such as the dead bodies of other mice. They have also been observed to self-cannibalize their tails during starvation. Grasshopper mice are an exception to the rule, being the only fully carnivorous mice. On average, mice eat grains, fruits, and seeds for a regular diet, hence their reputation for damaging crops. They are also known to eat their own droppings on rare occasions. Mice are social animals, preferring to live in groups. Male rivalry can become harmful for the animal, especially when confined to a small space. The natural habitats of the mouse are very diverse. Mice can be found in forests, savannahs, grasslands, and rocky habitats (Nowak 1999). In Africa, they tend to particularly like forest edges, derived savannah, and agricultural areas. 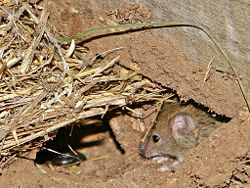 Mice build nests for protection and warmth, though different species have varying preferences: M. minutoides nest in shallow burrows, M. caroli and M. cervicolor burrow, while M. shortridgei and M. pahari nest above ground. Most species will construct nests of grass, fibers, and shredded material (Nowak 1999). Mice do not hibernate. The mouse has bichromatic vision, meaning it has two instead of three retinal photopigments tuned to peak wavelengths, or colors. It lacks a photopigment for the detection of red light (Jacobs et al. 2004). Mouse-like species are among the earliest mammals. It has been proposed that higher mammals evolved from rodent-like species many millions of years ago. Discoloration in mice was supposedly first noticed in China by 1100 B.C.E., where a white mouse was discovered. There is sufficient evidence that indicates that white mice were noticed in the times of the Greeks and Ancient Rome. The term "mouse" is often considered to be equivalent to the taxonomic term Mus, while house mouse is equivalent to Mus musculus. In common language, the term "mouse" often refers incorrectly to Mus musculus. There are 38 species of mice in the genus Mus, as shown in the following table. Mice are the most commonly utilized animal research model with hundreds of established inbred, outbred, and transgenic strains. In the United States, they are not covered under the Animal Welfare Act (AWA) administered by the United States Department of Agriculture, Animal and Plant Health Inspection Service as an animal. However, the Public Health Service Act (PHS)as administered by the National Institute of Health (NIH) does cover their humane treatment. Mice are common experimental animals in biology and psychology, primarily because they are mammals and thus are biologically similar to humans, but can be manipulated in ways that would be considered unethical with humans and larger mammals. "Pinkie" mice for sale as reptile food. A very common use of mice is to feed many species of snakes, lizards, and even tarantulas. Most U.S. pet stores now carry mice for this purpose. Mice are ideal to sell for consumption by animals of many different sizes, as they breed quickly, grow quickly, are easy to care for, and can be sold in a wide variety of sizes. Common terms used to refer to different ages and sizes of mice are pinkies, fuzzies, hoppers, and adults. Pinkies are newborn mice that have not yet grown fur. Fuzzies have some fur, but are generally not very mobile. Hoppers have a full coat of hair and are fully mobile, but are smaller than adult mice. These terms also refer to the various growth stages of rats. Mice specifically bred for pets and feeders are sometimes called fancy mice. Cage- Usually a hamster or gerbil cage, but specific mouse cages are also now available. Food- Special pelleted and seed-based food is available. Bedding- Usually hardwoods, such as aspen. Cedar or pine should not be used because they contain harmful liquids that can damage any rodent's respiratory system. Corn-cob bedding should also not be used because it promotes Aspergillis Fungus growth and allows mold growth once it gets wet. It also is quite rough on mouse feet. Recycled virgin wood pulp is also used. Mice are quite intelligent given their size. Mice have a short lifespan. ↑ . Retrieved August 22, 2007. ↑  . The word "mouse" is cognate with Sanskrit mush meaning 'to steal' which is also cognate with mys in Old Greek and mus in Latin Retrieved August 22, 2007. ↑ Public Health Service Act. American Heritage Dictionary of the American Language. 2000. The American Heritage Dictionary of the American Language, 4th Edition. Boston: Houghton Mifflin. Retrieved August 6, 2007. Concise Encyclopedia (Britannica). 2007. Mouse. Encyclopedia Britannica (online). Retrieved January 30, 2007. Encyclopaedia Britannica. 2007. Mouse. Encyclopedia Britannica (online). Retrieved January 30, 2007. Jacobs, G. H., G. A. Williams, and J. A. Fenwick. 2004. Influence of cone pigment co-expression on spectral sensitivity and color vision in the mouse. Vision Res. 44/14 :1615-22. Merriam-Webster. 2007. Mouse. Merriam-Webster Online. Retrieved January 29, 2007. Myers, P., R. Espinosa, C. S. Parr, T. Jones, G. S. Hammond, and T. A. Dewey. 2006. Superfamily Muroidea (mice, rats, gerbils, and relatives. The Animal Diversity Web (online). Retrieved January 30, 2007 at http://animaldiversity.org.Retrieved August 6, 2007. Silver, L. M. 1995. Mouse Genetics: Concepts and Applications. Oxford University Press.